"The Sade dance remix is something of an institution in global house culture. From the lush underground styling of the Musk Men rendition of 'I Never Thought,' to Nick Holder's deep vocal masterpiece 'Removable Tattoo,' house producers have proven time and again the inherent compatibility of Sade's sublime, sultry, singularly unique vocals with 4-to-the-floor dance music. If deep house is to be taken in its truest form, there is really no major label R&B artist more fit for its specific aesthetic than she. 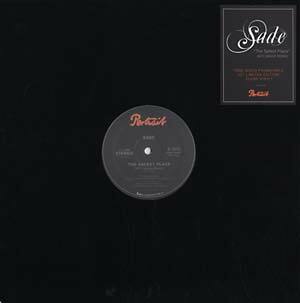 With this latest entry into the cannon of Sade house tributes, 'The Safest Place,' it's safe to say that the tradition has been reaffirmed and returned to its rightful niche of respectful reinterpretation, capturing the melodic seduction of Ms. Sade's music and pairing her innate charm with a suitably emotive production that does justice to her transparent and always sincere poetic beauty. Retaining the basic flesh of the original composition, the 'NYC Dance Remix' remains true to the song while transforming it into a contemporary take on the NY vocal house sound: driving tribal percussion, effectively moody pads and perfectly-placed vocal samples that resonate with despondent urgency. Surely, 'The Safest Place' as presented in its revamped form will take its place in the lineage of R&B-house remixes worthy of an already impeccable artist. Limited clear vinyl pressing." One-sided release.